The world, as everyone knew it, ended four years ago. 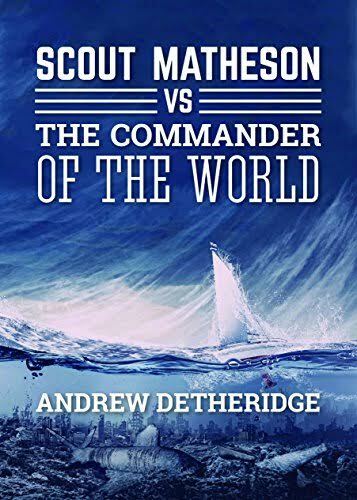 Scout Matheson was eleven years old when the meteor hit, sending a life-ending tsunami hurtling mercilessly around the globe. Four years on, those that survived still struggle to exist in the buildings that stretch precariously up from the grimy waters, or on the Floating Towns that endlessly search the seas for sustenance. Living with her grandfather, Scout scratches out a living as a Fetcher-and-Taker; a sort of post-apocalyptic post girl, maintaining lines of communication between the beleaguered inhabitants. One man makes life even more unbearable though- The Commander. General of an American aircraft carrier that miraculously survived the carnage intact, he rules the waves, destroying or taking for himself anything and anyone he desires. When Scout becomes his prisoner and discovers her scientist father is still alive, so begins a fantastic and mesmerising adventure of cloud-living communities, underwater bases and parallel universes.